Blakely Plaster, PA-C, Shawn Diamond, M.D., Donald J. Morris, MD. Background: Restoring abdominal domain and achieving primary fascial closure with component separation can prove difficult in massively recurrent ventral hernias. Tissue expansion in the subexternal oblique plane prior to herniorrhaphy may assist fascial closure in properly selected patients. Isolated reports exist in the literature documenting this technique; we present the largest series to date. 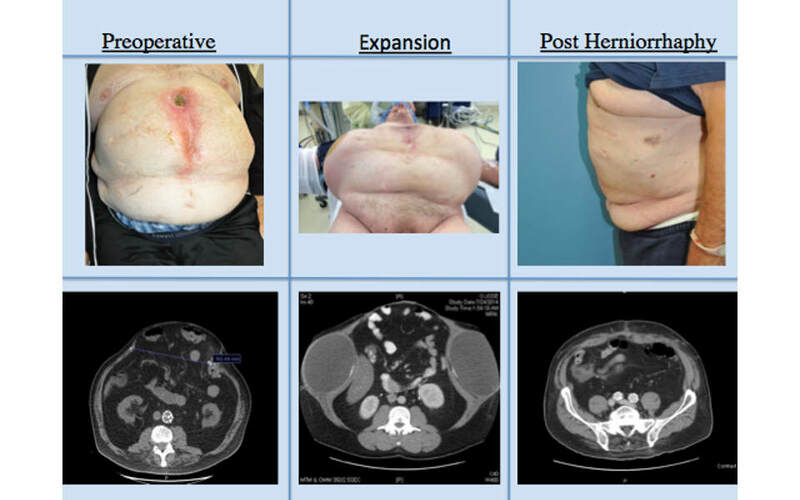 Methods: A single-surgeon series of abdominal wall expansion prior to herniorrhaphy was reviewed utilizing a prospectively maintained database from 2011-2017. Patients included had one-year minimum follow up. Primary outcome measures were fascial closure, hernia recurrence and morbidity. Analysis by univariate and multivariable regression identified risk factors for recurrence and complications. Indications for expansion included: hernia defects >15cm in all dimensions, bowel eventration and inadequate soft tissue envelope. Textured, shaped, stable-backed, integrated-port expanders were placed in the sub-external oblique plane via endoscopy lateral to the rectus. This allowed for concurrent anterior component release (Case Example). Results: Thirty-three patients met selection criteria, 45% were female with an average BMI of 30.6 (18.5-42.4), aged 51.6 (30-78) years old. Average hernia width was 16.9cm (15–26cm) Expansion time averaged 13.7 weeks – ranging from (6-21 weeks). In 25 of 33 patients (76%), primary musculofascial repair was obtained while the remainder underwent bridging fascial mesh. Five patients suffered recurrent enterocutaneous fistulae in the early postop period, unrelated to the hernia repair and were excluded from further analysis. The 27 remaining have a follow-up of 14.7 months (5-30 months). There has been one (3%) modest size recurrent hernia and two (6%) parastomal hernias. Complications include: one ruptured expander due to a motor vehicle accident and removal of one expander due to infection. Seroma was the most common complication (24%) and commonly arose in the midline rather than the sub-external oblique space (p<0.05). Ventral Hernia Working Grade and degree of preoperative contamination did not predict complications for either expansion or herniorrhaphy. Conclusion: The laminar approach to complex abdominal wall defects recognizes domain as a function of peritoneal space, fascial continuity, muscular coverage, and a closed skin envelope. Staged abdominal wall expansion to address deficiencies in any lamina proved to be safe and effective. The plastic surgeon is at a particular advantage to increase the role of abdominal wall expansion given their comfort with component separation and expandable devices. Case Example with select clinical photographs and axial CT images of a 78 year-old with massive bowel eventration, midline fistula and domain loss.